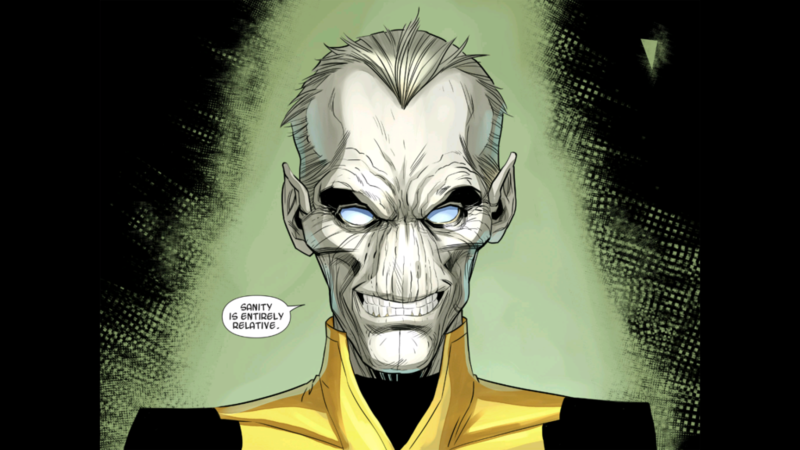 Ebony Maw is a brilliant but maniuplative member of the Black Order of Thanos. The Black ORder is a 5 member super team constructed by Thanos to be his elite group on the forefront of expanding the power of Thanos. Ebony Maw is rumored to appear in the film Avengers Infinity War along with the rest of the Black Order. He is a relatively new character but has become popular with notable appearances within the stories of Infinity, Cabal, Time Runs Out, Secret Wars, and Thanos. Quote: "I for instance...I operate in information, gaining influence, and seeding discord. However, I cannot tear into a man's mind and see what makes them weak...what makes them strong...I have to rely on my words...but what words they are...sweet whisper of secret fears" Ebony Maw as he controlled Doctor Strange. Ebony Maw is much like a cosmic powered version of the Purple Man who villainized Jessica Jones. He has brilliant, manipulator with an added power of persuasion. Maw does not have the ability to read minds, or feelings and has said that he must gain information from his victims through their own words. He is though very successful at manipulating his victims to tell him what he wants, and then do what he wants. The early years of Maw are unknown. He is powerful, morally indifferent and selfish and is recruited into Thanos's Black Order. His purpose in the Black Order is as a spymaster he gains information, sows discord, and gains influence. Unlike the other members of the Black Order, Maw has no true fighting capability his powers are isolated into the realm of influence and persuasion. Maw is not loyal to anyone including Thanos. He makes it clear that he does not like Thanos, or even agree with the goals of Thanos. He serves purely out of respect of Thanos's power and when opportunities to topple Thanos arrive he is consistently the first betray him. Maw is consistently the first to betray anyone if it serves his own ends. When Thanos sets his eyes on conquering Earth and taking the Infinity Stones he sends out his Black Order with various tasks. Maw is sent to neutralize and control the Sorcerer Supreme Doctor Strange. Once Maw has control of Doctor Strange however he begins to see a way to betray Thanos. He uses the abilities of Strange to learn about Thane the son of Doctor Strange. When Thane's powers go off Maw moves in and gains control of Thane. He uses Thane to entrap both Thanos and Corvus Glaive in his amber power. Effectively, Thane is able to entrap powerful entities in a state of living death. Maw stays with Thane guiding, advising and training Thane to become a cosmic Tyrant much like his father. In Maw's eyes (at least in his manipulations) Thane has the ability to be greater than his father. The two run into trouble when attempting to conquer the realm of Corvus Glaive. Glaive had prepared for Thane's attack. He used magic from a special coven of witches to depower and capture both Thane and Maw. Thane waited 8 months for Maw to free him but later learned that Maw had escaped and left him to rot in prison. The whereabouts of Maw are unknown. Manipulation Ebony Maw is able to persuade people to say and do what he wants. This seems in part due to his powers but also due to a kind of brilliance in understanding what motivates people. Ebony Maw is rumored to appear in with the rest of the Black Order in the film Avengers Infinity War. He is relatively new character but has become popular with notable appearances within the stories of Infinity, Cabal, Time Runs Out, Secret Wars, and Thanos. A man in a CGI suit has been seen battling Doctor Strange with a tag labeling him as Maw. Presumably this is Maw confronting Doctor Strange much as he did in the comics. The pictures for the scene can be seen on JustJared.com. Early reviews say that EbonyMaw has some major show stealing scenes in Avengers Infinity War. He is said to have a wry sense of humor.